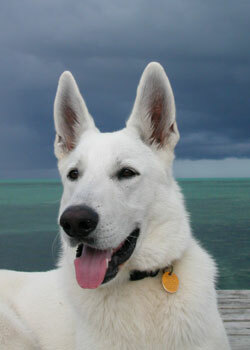 Hello, I have a White Female German Shepherd, a few years old at that. Anyway, She will not stay still for me to give her the Tic Treatment she needs for her ears, every day she goes to a corner of a room and scratches at her ear whining for at-least 1 1/2 Minutes. I do not know how I can give her this Medicine she needs as she is not a calm dog, the most she has to have a day is 5 Drops in each ear, 2 times a day, the most I've got was 1 in each ear, which probably does no good. any advise on helping me give her this Tic-Treatment she Needs? She is stubborn.